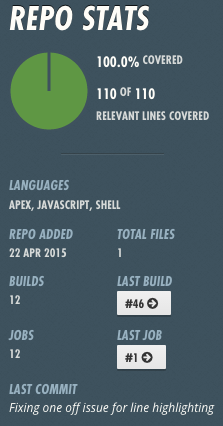 When we started working on the Apex Lodash project we knew we wanted to publicly post our code coverage percentage. To do this we chose to use coveralls.io since it is free for open source projects. In a previous post I talked about how to setup Travis CI to deploy your Salesforce code automatically. 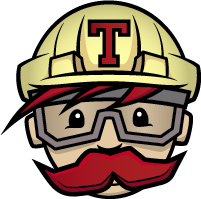 We will be updating the Travis CI configuration to push the testing results to coveralls. There don’t seem to be too many options around for code coverage display on the Internet. Coveralls has lots of options for various coding languages and a pretty nice interface. Like Travis CI, Coveralls is free for open source projects and they do have paid options that supports private repositories. It does support several other CI platforms if you’re not using Travis CI. Connecting to Coveralls is as easy as logging in with your GitHub credentials and enabling it for your repo. Building on the repo structure from before we add a testing directory under the build / scripts directory. Under here we’ll add the build/scripts/testing/package.json file that will include all of our NodeJS dependancies. And now the heavy lifting the build/scripts/testing/getTestResults.js will run our tests, and get the aggregate code coverage and store it in coveralls. Don’t forget to set the executable flag on the script. Next we’ll add the coveralls environment variable to the Travis CI build. By clicking Settings ⇨ Settings ⇨ Environment Variables, we can add our variables in the web Travis CI UI. On the right hand side of the Coveralls page there is “Repo Token.” You’ll copy that and add it to the COVERALLS_REPO_TOKEN in Travis So make sure that you set the “Display value in build logs” so that your token does show up in the logs. This entry was posted in Development, NodeJS, Salesforce and tagged CI, coveralls, development, Salesforce, travis ci. Bookmark the permalink. Thanks for providing this script, been trying to work out ways to get the code coverage displayed. We are not going to use Coveralls, possibly just output a CSV for Jenkins to chart initially. Hopefully you might have a clue as to why this is throwing an error? The problem was that I was setting the version but as a float apparently when it was expecting a string.